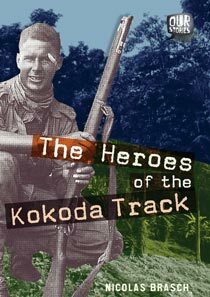 The Heroes of the Kokoda Track covers one of most pivotal moments in Australia’s history and one that every Australian should know about. Nicolas Brasch has managed to jam in all the essential information of that four-month long campaign plus the historical background as to the reasons why the world was at war, in Europe as well as the Pacific. Every aspect of the campaign is covered from why Papua was so important, a brief summary of the fighting, which Australian battalions were involved, the conditions soldiers endured, the Fuzzy Wuzzy Angels, the Allied command and the Japanese perspective. The beauty of this book is that it presents all this information in a way as to not overwhelm younger readers. The design and lay-out is outstanding. Text boxes, current and historical photographs, maps and artwork all contribute to the telling of this important event. A timeline covers the period from World War One to the Japanese surrender on 14 August 1945. To me, the most enlightening aspect was the personal recounts from men at the front. That is where the real story lies. The vast range of primary sources included equips teachers with a valuable resource that can be utilised from middle primary school and up. Part of black dog books’ Our Stories series, this exceptional offering deserves to be in every public, school and home library in the country.